An all time comedian who never fails at giving you some of the best jokes you’ll heard in your life. Putting his African twist on these jokes will give you a clear understand that not only is he a funny man but he’s really trying to get his point across which makes 10x much more hilarious! Not only will he get you with his looks, but he’ll also get you with his positive rants that he will be doing weekly to give you guys a taste of Jay and how to live an inspirational life. What can be more positive than a guy spreading positive rants in such a negative world? This ultimate diva has her own personality that will spark you up out of your seat! From vlogging to giving you her personal rants, to letting you know how big her booty is, this white chick ain’t playing no games when it comes to letting you know how fun she can be. This girl will have you questioning your own fashion sense, damn. Dominique is a girl that’s all about fashion, beauty and fun! Come into her world and experience how she gets down when it comes to being a beauty guru and fashionista! “Artistry is creativity, Nick a filmmaker and member of the creative group UhOh Monkey, seeks to create a positive change in the world through his many talents. A comedian at heart, but has no limitations as far as genre, Nick’s goal is to make someone new laugh everyday. Copyright 2016. 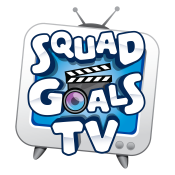 SquadGoalsTV, All Rights Reserved.